The international banking system is broken. The cryptocurrencies are going to reshape it! If I want to send 30’000 USD from Germany to an African counter party. It would take 3 to 4 days to have the amount credited on the African bank account AND it will cost around 400USD! It’s a steal! The SWIFT protocol on which the international banking system is built is slow, expensive and prompt to mistake! Here is a short and simplify of how L/C works. Seller (S) wants to sell 15’000mt of rice to a Buyer(B). 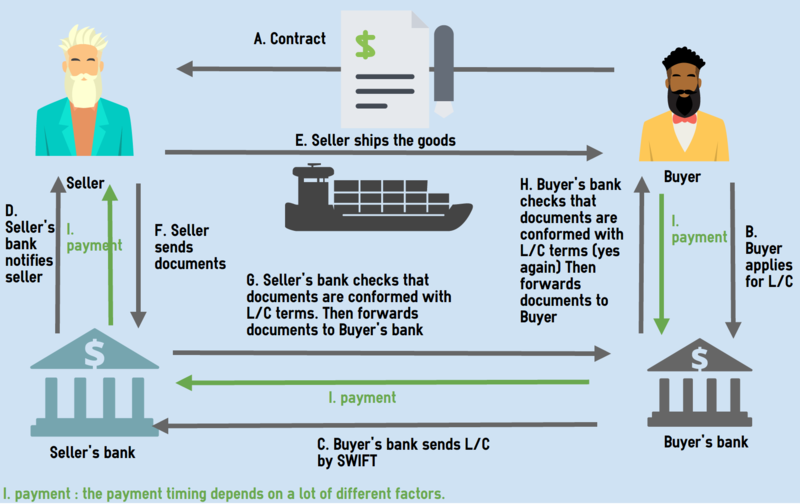 As you don’t know well the buyer you ask him to open a L/C for the value of the shipment. Once the rice is shipped on the vessel, S sends the sets of documents stated in the L/C to the SB. OB sends the documents to B. Have you followed??? Bravo! Ok now just few ways to show you how horrible is this way of doing business. Manpower: You need someone in house reviewing and issuing each document to be perfectly in accord with L/C terms. Something you need 13 documents issued by different parties and you must make sure that the wording stays exactly the same as per the L/C requirement. Banks are not willing to work with any other banks! If your client is located in a small country with no large international banks. It may almost be impossible to find another bank willing to work with them… OR you need to add a 3rd bank between OB and SB to bridge the trust. And don’t forget ! each bank takes a fees. I can go on, for hours like on how stupide this method is. But here comes the light! the block chain and smart contracts! Then when shipping company scan the containers at the arrival payment is executed. I’m not saying this will arrive within 5 years, but I’m sure we will come to this point. There are no reason to continue with this flawed system. Ok, this is a real issue. The volatility incentives bad behaviors among the market participants. You are a one of the biggest coal buyer in China. You have concluded a delivery in 8 months with a small Singaporean trader from an Australian mine. As you think that the market will increase, and you want to cover your needs. Bad luck, you are complete wrong, the market is divided by 2. You can buy the exact same coal for 300’000USD the cargo instead of 600’000USD. Furthermore, your company is not in a good financial shape, and 300’000USD would really help you. What do you do? Are you really going to honor your contract and take the shipment? You are in China, you know for the Singaporean it’s going to be almost impossible to take any legal action against you. What do you do ? Where do I want to go with that ? I’m just saying that the people with the right leverages will not accept (or be able) to take their losses and there will be collateral damages. In the current crypto world, there are a lot of games of powers amplifies by the crazy market volatility. The volatility reduces the market adoptions by the more conservative people and push to speculation and bad behaviors. At a certain point, we will need to cryptocurrencies markets to calm the f*** down to have a broader and healthier adoption. If you follow my instragram HERE , you see that I spend a lot of time out of the western world. Those people are the one needing THE MOST a cryptocurrency not regulated by any central entities. Tho, there are the most in need of the technology, I don’t see a massive adoption before it’s common practice in the western world. Computer education: The new middle class all use smartphone, but I noticed that their educations in term of how to use a computer is small. Using a simple office suite, it’s not as common as we could think. General education: The level of extrapolation you need to attain to understand the concept of cryptocurrency is already quite challenging for the people with a high education. So, imagine when you have none… Cryptocurrency must be easy to use and already quite advanced in their general adoption to have a mind-switch and start to use the currency as it is without having the need to understand what’s behind it. Currency control: This is the biggest hurtle. Of course, the government will do everything in their power to avoid a general acceptance of cryptocurrency. But don’t forget that most of the less developed countries have currency control. Meaning you must show a proof and provide an explanation when you want to exchange your local currency in USD or EUR. Therefore, how can you send your money to a broker ? As far as I know there are no brokers accepting Guinean franc or Algerian dinar. Cash is king : Yes… most of the transaction are cash-based. Believe me, I saw backpack full of cash to pay a container of sugar or rice…! And people have no bank account. I met few rich people who rather have a safe hidden than a bank account. I deeply believe that the blockchain technology will dramatically decreases the cost of international trade while making it less risky. For the less developed countries, I truly think they are the one who need the most an alternative to their current currency. Unfortunately for them, I also think there are massive challenge to overcome before seeing a broader adoption. Now, I have strictly no idea if buying Bitcoin, Ethereum, or any new cryptocurrencies is a good idea. You don’t want to put your money in the NOKIA/BLACKBERRY of phone or KODAK of camera. I don’t know. Just be wise and don’t invest/gamble with money you need. L/C would be a perfect to be executed on a smart contract platform on the top of a blockchain. But yeah, before that, lot of problem to solve ! Long road ahead !